One of the hardest items to select is the sofa. 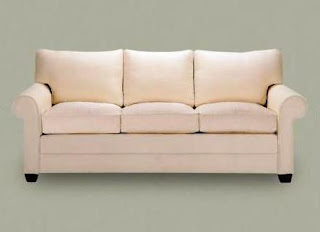 In the outfitting of a home, I think a sofa is one of the major and most expensive purchases for most people. There are two types of sofas, the traditional sofa and the loveseat. In the first design class that I took, my professor always referred to loveseats as two-seater sofas and that is something that has stuck with me. Here on The Traditional Home, I will refer to them as two-seater sofas. Moving on. One thing The Traditional Home will attempt to do is focus on finding quality pieces at realistic and affordable prices. One of my favorite furniture manufacturers is Baker. Baker makes some of the most high quality upholstered furniture that is sold. Unfortunately, most of us cannot afford Baker prices. 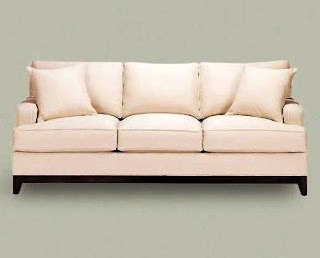 A Barbara Barry designed Baker sofa will be at least $4,500 and that is without fabric. The trick is to get inspiration from the upscale furnishings, but find something similar at a more affordable store. One company that I think makes some great upholstered pieces is Thomasville. I don’t particularly like that they decided to shift their production to China, but I think it is still possible to find some great pieces from them. Another company that I really love right now is Ethan Allen. The company has three sofas that I think are fabulous. 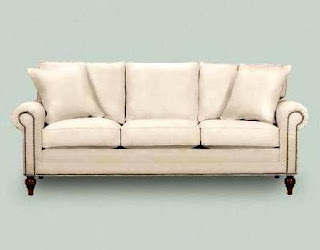 If I did not know any better, I would say that the Bennett Sofa is EA’s flagship sofa. It comes in quite a few different versions. I think the wedge version is worth a close look. It’s my favorite sofa of all the EA offerings; however, I would love it even more if it had bun feet. I generally do no like the wedge feet on sofas. I think bun feet are more traditional. One company that is really popular in the U.S. is Ashley Furniture. Ashley sells furniture under three names: (listed from low to high end) Signature, Ashley, and Millennium. The company has many different offerings and it’s very possible to find a decent sofa, but from an investment point of view, I would recommend looking at higher end brands. The nest part of this post will explain why. A big part of traditional design is the textiles. I love sofas with patterns such as damasks or stripes. So the first rule when selecting a sofa, especially one with a pattern, is to stand back and really investigate the quality of the upholstery. A well constructed sofa involves the matching of patterns. Next, take a look at the cushions. I think even the best constructed and padded cushions will wear over time, but look at what the cushions are composed of. Is there double foam around the padding? Is there just a think layer of padding and polyester fill? Remove the cushions from the sofa and inspect the frame and the springs of the sofa. The composition of the frame and the kind of springs that the sofa has are the two most important things to consider when buying a sofa. The most expensive springs are 8 way hand tied. If you look at the frame and see nothing but glue and staples, move on. A quality sofa is going to have a frame that is glued, dowelled, and screwed or bolted. And the wood should be kiln dried. This removes all moisture. More than anything, ask the sales people, if they are not able to explain all of the attributes of the sofa, either find someone that can or move on to another furniture store. In addition to buying a new sofa, consider searching for period or antique furnishings. There are two major periods of American furniture: Colonial and Federal. Included in the Colonial Period are the Colonial, Jacobean, Queen Anne, and Chippendale styles. Included in the Federal Period are the Hepplewhite, Sheraton, and Classical styles. Each of the styles influenced the style that followed. For instance the cabriole, or curved, legs prevalent in Queen Anne furniture is heavily featured in Chippendale furniture. One of the best places to look for antiques is Michael Bruno’s 1stdibs. Instead of running around to thrift stores or antique shops, you can long on to 1stdibs.com and shop to your heart is content. In the future, I plan on writing about classical furnishings in more depth. great blog - good luck with it!!!!! !